The Mackenzie River is a major river system in northwestern North America. It is exceeded only in basin size by the Mississippi-Missouri system. The entire Mackenzie River system is 2,635 miles long and passes through many lakes before emptying into the Beaufort Sea of the Arctic Ocean. The Mackenzie River alone is 1,025 miles long when measured from Great Slave Lake. It begins at Great Slave Lake where the elevation is 512 feet above sea level. Great Slave Lake can be as deep as 2,000 feet in certain places. It is filled with clear water on the eastern side and shallow, murky water on the western side. The headwaters of the Mackenzie River include numerous large rivers. The drainage basins of the Mackenzie River include the Liard River, Peace River, and Athabasca River. The ice that forms on the Mackenzie River over the winter months begins the break up in early to mid-May in the southern sections. Ice covering some portions of the Mackenzie River can break up as late as the end of May. The Mackenzie River basin is home to a very small and sparse population despite the natural resources available in this area. This area is home to muskrat, marten, beaver, lynx, and fox. Pulpwood and other small conifer trees can be found here. Petroleum and natural gas are usually the underlying reason larger settlements have formed in this area (Robinson 1999). Robinson, J. Lewis. 1999. Mackenzie River. July 26. Accessed May 2017, 2017. https://www.britannica.com/place/Mackenzie-River#ref466063. Hay River is a town in the Northwest Territories, Canada that was incorporated at a town in 1963. It is located on the south shore of Great Slave Lake, at the mouth of the Hay River. 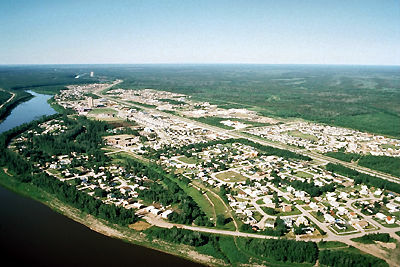 This town is located 201 air kilometers southwest of Yellowknife. The town was permanently settled in 1868 by the Hudson’s Bay Company to establish a trading post with Anglican and Catholic missions. The Catholic church built during the late 1800s in Hay River is still being used today in the Hay River Reserve. The Hay River Reserve is home to about 300 K’atlodeechee First Nation and was created in 1974. Before the arrival of the Hudson’s Bay Company, the area was used by the Slavey Dene people. The town had a population of approximately 3,606 in 2011. Most members of the current Hay River community have ties to the postwar construction of the Mackenzie Highway. Due to its important transportation and communication amenities and abilities, Hay River earned the nickname “the hub of the north.” This town houses the staging point for shipping up the Mackenzie River and the commercial fisheries of Great Slave Lake. The economy of Hay River today relies heavily on private enterprise (The Canadian Encyclopedia, n.d.). The Mackenzie Highway is the longest in the Northwest Territories. It begins at the Northwest Territory and Alberta border and ends at Wrigley, Northwest Territory. It is approximately 690 kilometers or 429 miles long. About 280 kilometers are paved while the rest of the highway is covered with gravel (Government of Northwest Territories, n.d.). The construction of this highway was ongoing between the 1940s and 1970s. 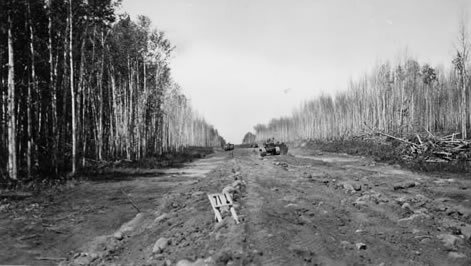 In 1945, the Canadian federal government and the government of Alberta signed an agreement to build an all-weather road that would replace the existing Caterpillar tractor trails from Grimshaw to the Great Slave Lake of Hay River (Prince of Wales Northern Heritage Center, n.d.). As time passed and focus shifted to fossil fuel collection, the motivation behind further construction of the Mackenzie Highway was in “anticipation of a major oil pipeline development along the Mackenzie River valley” (Pomeroy, 1985). The intended use of the highway was to enable the pipeline developers to haul construction materials throughout the area. During its construction, many chiefs of the Indian Brotherhood opposed the completion of the Mackenzie Highway. There was additional opposition voiced from the people of Wrigley who also did not support further construction of the Mackenzie Highway (Cox, 1975). Cox, B. (1975). Changing Perceptions of Industrial Development in the North. Human Organization, 27-33. Pomeroy, J. (1985). An Identification of Environmental Disturbances from Road Developments in Subarctic Muskeg. Arctic, 104-111. The Great Slave Lake was found in 1771 by Samuel Hearne (Ernst). 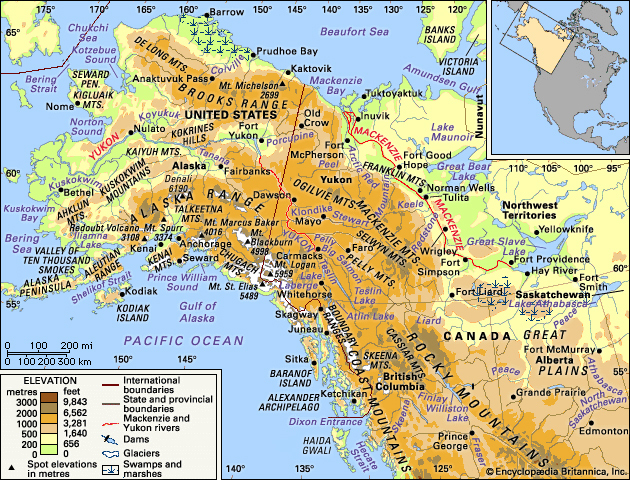 Many others passed through during the Klondike Gold Rush in 1896-1899, but the region surrounding the Great Slave Lake remained greatly unoccupied. In 1930, a radioactive uranium mineral called pitchblende, or uraninite, was discovered on the shore of the Great Slave Lake and incentivized colonizers. 1934, gold was discovered on Yellowknife Bay, which led to a Yellowknife community settlement. Today, additional communities in this region include Hay River, Fort Resolution, Fort Providence, and Behchoko. The Great Slave Lake is the fifth largest lake is North America and is part of the Mackenzie River System. The Lake gets its name from a tribe of Native Americans called Slavery First Nations (National Geographic). This tribe fished for sustenance and did not explore farther than their immediate surroundings. Their neighbors, the Cree, thought the tribe was weak and often called them awonak, which means slaves. Explorer Peter Pond named the lake the Slave Lake in 1785 and then the Great Slave Lake in 1790. The Lake is known for its variety of types of fish, including trout, pike, and Arctic grayling. The Great Slave Lake is covered in snow and ice 8 months out of the year. The Great Slave Lake region is also the home to the largest intact forest in the world, the Boreal Forest, which contains evergreens, bogs, shallow lakes, and ponds (Pala). This Great Slave Lake cove is the habitat for caribou, waterfowl, beavers, and many fish species. Ernst, Chloe. "The History and Sites of Great Slave Lake: A Visitor's Guide.” PlanetWare.com. Accessed April 06, 2017. http://www.planetware.com/northwest-territories/great-slave-lake-cdn-nt-ntgs.htm. National Geographic, February 2002, 1. Global Reference on the Environment, Energy, and Natural Resources (accessed April 5, 2017). http://find.galegroup.com/grnr/infomark.do?&source=gale&idigest=6f8f4a3faafd67e66fa023866730b0a1&prodId=GRNR&userGroupName=bucknell_it&tabID=T003&docId=A83374988&type=retrieve&PDFRange=%5B%5D&contentSet=IAC-Documents&version=1.0. Pala, Christopher. "Forests forever. (Forest conservation in Canada)." Earth Island Journal, September 22, 2010. We can make the argument here that the University of North Texas, the Oklahoma Historical Society, and the Ethics in Journalism Foundation support de facto slave labor. Let's be honest here: "workers" = "prisoners"
letting them take lower-class citizens and prisoners of war. Might this be the Niger? GORGIAS: What is there greater than the word which persuades the judges in the courts, or the senators in the council, or the citizens in the assembly, or at any other political meeting?—if you have the power of uttering this word, you will have the physician your slave, and the trainer your slave, and the money-maker of whom you talk will be found to gather treasures, not for himself, but for you who are able to speak and to persuade the multitude. Rhetoric can give freedom and create slavery, give power and wealth.